Picture books that portray fatherhood are extremely rare perhaps because a significant minority of families in contemporary society have absent dads. 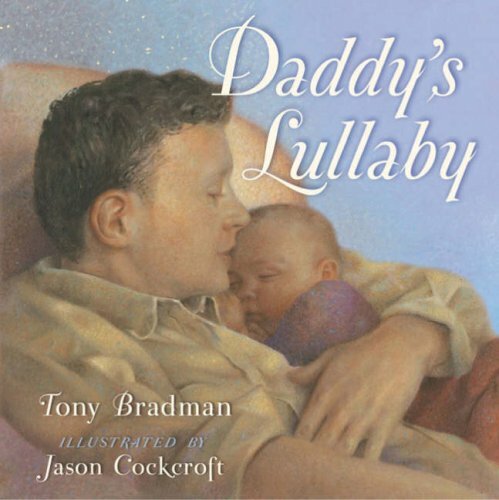 Dad’s Lullaby explicitly tries to redress this imbalance by presenting an image of fathers as loving and caring. The main message is clear: fathers who come home so late that they don’t get to see their kids still love them. Jason Cockcroft’s illustrations are realistic and reflect the joys of parenting young children. They induce that warm and fuzzy feeling that is experienced when viewing photos that are taken in soft focus. Unfortunately some of the narrative (‘Am I glad it’s Friday!’) can’t decide if it will rhyme and the modified version of ‘Rock-a-bye Baby’ that forms the emotional core of the book is doggerel.